Although the process is consistently described as “fermentation,” it really isn’t that in the strictest sense, as the transformation does not involve microbial processes—specifically, enzymatic breakdown and the Maillard Reaction are responsible for the caramelization of the sugars, dark color and deep, complex flavor profile. As the pearly white cloves slowly transition into their final black appearance, compounds in the fresh garlic transform into a whole new range of compounds. Compared to fresh garlic, black garlic is low in alliin but it is astonishingly high in other antioxidants! In a 2009 mice study, Japanese researchers found that black garlic was more effective than fresh garlic in reducing the size of tumors. The study was published in the journal Medicinal and Aromatic Plant Science and Technology. 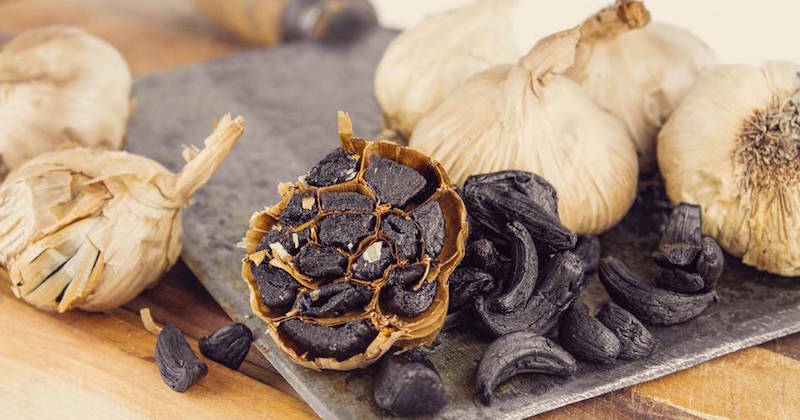 In another study, black garlic was found to have twice the antioxidant levels as fresh—the aging/fermenting process appears to double the antioxidants. Black garlic is packed with high concentrations of sulfurous compounds, especially one in particular: s-allylcycteine (SAC). Science has shown a number of health benefits from SAC, including inhibition of cholesterol synthesis. An advantage of SAC is that it is well-absorbed and much more stable than allicin and 100 percent bioavailable. Researchers are confident it plays a significant role in garlic’s overall health benefits. Be mindful, however, that black garlic’s benefits may be more effective than fresh garlic for some conditions but not others, given its allicin content is low. For example, I suspect it may not be as effective if you have an infection, as allicin is thought to be the primary anti-infective agent in garlic, and fresh garlic is higher in allicin than black. Do you toss your garlic into the compost pile when it begins sending up those bright green shoots? You might want to stop doing that after you read the most recent report about sprouted garlic. In an article published in the Journal of Agricultural and Food Chemistry, garlic sprouted for five days was found to have higher antioxidant activity than fresher, younger bulbs, and it had different metabolites, suggesting it also makes different substances. Researchers concluded that sprouting your garlic might be a useful way to improve its antioxidant potential. Extracts from this garlic even protected cells in a laboratory dish from certain types of damage. Growing your own sprouts is a great way to boost your nutrition, especially if you have limited space for gardening. Sprouted seeds of various kinds can contain up to 30 times the nutrition of homegrown organic vegetables and allow your body to extract more vitamins, minerals, amino acids, and essential fats from the foods you eat. Whether you choose to go raw or adventure into the black, you can’t go wrong with garlic. It gives new meaning to the term “heart healthy food”! And garlic goes with just about everything. You can smother your roasting chicken with it, sauté it with veggies, add it to your salad dressing, or run it right through your juicer along with the other veggies for a real immune-booster. Whatever form of garlic you prefer, you can have some fun experimenting as you widen your culinary repertoire, and build your health at the same time!